MLiS MLB-W4301 is a dual band 802.11ac PoE AP designed for 1 gigabyte Ethernet communication via any readily available WiFi carrier network. Overall, it offers a more cost effective and time to market solution for bridging remote machine to machine over diverse locations without first having to invest and engineer a huge complex network. MLB-W4301 AP uses the RJ45 connector to provide data communication interface and PoE function, besides the DC jack to provide power input. LEDs are used to indicate the status of the AP. 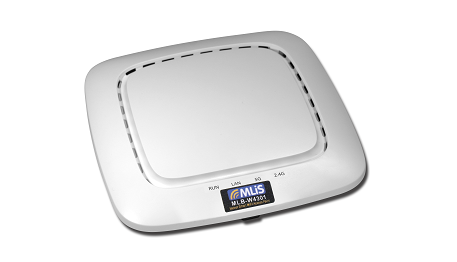 MLB-W4301 AP can be used to provide a wireless communications link for many applications, such as indoor coverage as stand-alone AP and Wireless Mesh Network.